We all have our favorite pair of jeans that we turn to time and time again. With so many choices on the market, it takes some experience to really select something that will become your go-to. Luckily there’s no shortage of choices with almost every designer offering up some interpretation of the tried and true staple. With the global denim and jeans market valued at around $60 billion, it’s important to cut through the clutter and highlight some of the most iconic designer pairs to date. Below are our favorites ever. What are the best designer jeans in your opinion? Let us know in the comments below. Undercover has no shortage of grails in their long history, but the 85 denim is undeniably one of their most iconic pieces. Introduced in the Fall/Winter 2005 “Arts & Crafts” collection, these jeans are intricately hand-distressed. Consider them a nod to designer Jun Takahashi’s punk rock legacy. It’s no doubt that Takahashi has had plenty of first-hand experience distressing and trashing vintage denim and this comes across in his uncompromising design. For the serious UC collector, these are an absolute essential. Once you’ve seen these jeans, they're impossible to forget. While the process of screen-printing on denim is not particularly novel, Watanabe takes it to the next level with his iterations on the concept. His ability to innovate with denim is assisted by the fact that he’s able to work directly with Levi’s on product each season. One of the best things to come out of the on-going collaboration are his jeans with screen-printed quotes on them. While not for everyone, the jeans literally speak for themselves with extended quotes on life and love. With Watanabe working extensively with patchwork and other eye-grabbing patterns, these jeans are a perfect accompaniment to the look. Julius was founded by Tatsuro Horikawa in 1991 as a means to presenting film projects, but became a full-fledged clothing line in 1994. Julius takes inspiration from the Horikawa’s interest in architecture and zen buddhism. The twisted seam jeans stand out to this day as they are cut to perfectly stack on top of footwear. The denim has a curved look when laid flat and are specifically patterned to attain the desired look. There’s tons of details on each pair that make these distinctive, including belt loop rings and gasmask snap pockets. These are absolutely worth tracking down if you’re a fan of stacked denim. Hedi Slimane’s influence on men’s fashion can’t be overstated. There was a time when Dior Homme defined the direction of menswear and shifted the entire market to a slimmer fit. It’s even frequently mentioned that Karl Lagerfeld himself lost about 90 pounds just so he could fit into Slimane’s skinny suits. Throughout Hedi’s reign at Dior Homme, his jeans were a best seller, in particular the tapered 17cm cut best exemplified the rock attitude that defined his career. While Dior Homme jeans came in a wide variety of washes and colors, the Claw Mark denim was some of the most sought after. Defined by elaborate washes with defined whiskeringm they became favorites for celebrities from Jude Law to Kanye West, even spawning the classic track Christian Dior Denim Flow . The founder of Visvim, Hiroki Nakamura, is an avid vintage clothing collector and his expertise in that field comes across in the label’s designs. Certainly there was plenty of thought put into the Social Sculpture designs. Nakamura has stated that he was not interested in simply reproducing 1930s-40s workwear denim, but instead wanted to build something with tradition in mind that would translate better to the needs of modern life. In that way, Visvim's jeans make use of custom yarns as well as a rope-dyeing method that is both time-consuming and labor-intensive. Custom hardware and great looking washes round out what makes Social Sculpture denim, like all of Visvim's products, special. These jean are extremely comfortable and a must-have for any Visvim fan. A.P.C. denim can be best described as a gateway drug for many guys just getting into designer denim, helping shepherd the raw denim movement of the mid to late-2000s. The New Standard model has more than lived up to it’s name, offering a slim-tapered cut that has become A.P.C’s best seller. The jeans have maintained their popularity by sticking to the essentials: a forgiving cut, minimal detailing and a midweight Japanese selvedge denim that wears in easily. The New Standard is such a modern classic that the model was selected by none other than Supreme for their 2009 collaboration with A.P.C. Rick Owens launched his more streetwear and denim-focused line DRKSHDW in 2008. It was meant to offer Rick Owens loyalists quality basics that complemented the aesthetic of the mainline. If you’re looking for denim to pair with Geobaskets or combat boots, this is probably your best option. The variety in the DRKSHDW line is what makes the jeans so versatile. There are a wide selection of cuts, washes and finishes to choose from each season, with many pointing to waxed iterations and the Detroit cut as personal favorites. Slimane's second entry on this list, consider Saint Laurent's Crash denim the spiritual successor to the infamous Dior Homme skinny jeans. Slimane embarked on one of the most controversial luxury re-branding projects in fashion history when he took the reigns at YSL in July 2012. During this process, he turned around the struggling label, making it one of the most profitable under the Kering umbrella. Noted for their destroyed appearance, the Crash denim ushered back the feeling of '90s grunge with their heavily distressed, washed-out look. The jeans pair perfectly with chelsea boots or slim-profile sneakers, especially SLP's owns versions. Their exceptional popularity amongst celebrities inspired a slew of imitators down-market. Despite the departure of Slimane at Saint Laurent, these jeans are a constant reminder of his second act and overall legacy. Balmain’s biker jeans became immensely popular and pushed the price barrier for designer denim well past the $1000 mark. Balmain designer Olivier Rousteing took over the label in 2011 and quickly established denim as a key point of focus for the label though the original design can be traced back to his predecessor, Christophe Decarnin. Regardless, the biker jeans are a statement piece that has become ubiquitous. Rousteing has frequently exclaimed his love of denim and, in particular, '90s jeans from the likes of Gianni Versace and Jean Paul Gaultier. It’s no surprise then that he constantly references a distressed, washed look that harkens back to that era. White paint has always had special significance at Margiela. The Belgian designer used paint to express his interest in the effect that the passing of time has on our lives. Walls may be freshly painted or yellowed with age in Margiela stores. Early on in Margiela’s career, he had collected furniture from around the world and had it painted white to achieve a cohesive appearance. This same idea was brought to denim with Margiela designing jeans that were painted over. Often beginning with a standard blue jean, the hand-painted denim will slowly degrade with wear, exposing the original material underneath for a one-of-a-kind finished product. Helmut Lang introduced the Painter Jean in S/S 1997 and it remains one of his most celebrated designs. Lang held a fascination with workwear, denim in particular, and that interest shows up throughout his work. The Painter Jeans are modeled after the Levi’s 1947 501XX model, but the fit was updated throughout. The fabric is medium-weight denim that has been washed, sanded, distressed and paint-splattered, giving the jeans their signature look. Made in Italy from Japanese fabric, Lang's denim helped lay the blueprint for almost all designer jeans that were to follow. An interesting pop culture point about these jeans is that they were worn on the cover of New Order’s 2001 album Get Ready. 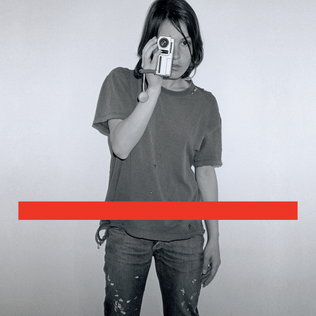 Art directed by Peter Saville, the cover is thought to be a reference point for design of Kanye West’s Yeezus.